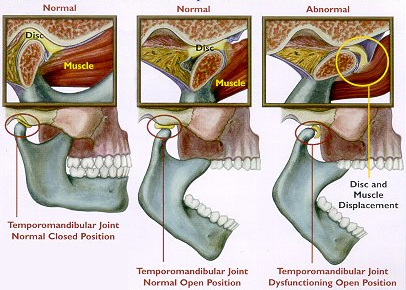 Why do temporomandibular joints click? Laxity of the posterior distal ligaments allows the disc to move forward into an abnormal position and it may momentarily obstruct forward condylar translation during jaw movements. The disc may be trapped and stretched forwards but further movement releases it suddenly and it snaps back into its normal position, giving rise to the audible and palpable click that the individual appreciates, this is an opening click. A closing click arises during closing and is caused by the condyle rapidly repositioning posteriorly (towards the back), displacing the disc anteriorly (towards the front) or medially (towards the side). Both are associated with a disc that fails to move in a coordinated movement. When an individual has both a opening and closing click they are said to suffer from reciprocal clicks. Why do joints lock in internal derangement? Sudden locking of the jaw (inability to open) implies total obstruction of forward condylar movement (translation). There are two types of lock: a closed lock and an open lock. 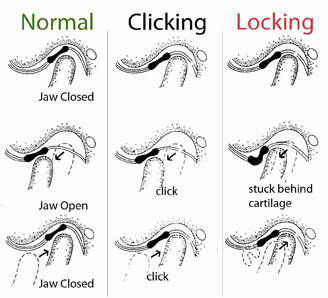 Locking and clicking are presentations of the same process – internal derangement of the joint. If the discal ligaments become very stretched or even ruptured, the disc may move anteriorly into a very displaced position and become fixed in the anterior fornix (arch shaped bone structure) of the jaw space. This completely obstructs forward translation of the condyle. Locking of this type can be acute on onset but usually follows many years of reciprocal clicking. In this case, the condyle is stuck behind the disc, the individual cannot open their mouth and so the condition is known as closed lock. In an open lock the mouth is locked open and the condyle is in a forward position (lock jaw). This happens in subluxation (partial displacement of the joint) or dislocation (full displacement) of the joint. What investigations may help diagnose trismus? Plain radiographs will probably show no abnormality because there is no change in the bony structure of the joint. If a pathological process other than internal derangement is suspected then radiography may be helpful. A dental panoramic tomogram is usually the first view of choice with other tomographic projections including spiral tomography cone beam CT or CT (computed tomography) giving additional information. Magnetic resonance imaging (MRI) would show the malpositioned disc and this may sometimes be helpful in diagnosis. Arthrography – radiography with a contrast medium injected into the joint – is possible. Lower joint space arthrogram is more helpful but it is more difficult to inject medium into the lower joint space. Serology for rheumatoid factor and an autoantibody profile may be indicated if a polyarthropathy is suspected, however some causes of arthritis are sero-negative, for instance psoriasis (A chronic skin disease characterized by dry red patches covered with scales). How should dental trismus be managed? Trismus treatment and management varies depending on the cause of the condition. But generally the acute phase can be managed by resting the muscles involved. Soft diet, limit mouth opening or chewing on both sides is usually advised. Moist heat or balm can also be applied over the painful muscle and splint therapy to reduce muscle activity, for example stabilization splint, can be prescribed by the dental surgeon. Most cases of closed lock resolve spontaneously. A consensus view supports conservative management for a period of at least 3 to 6 months with prescription of analgesics if required. The joint should be mobilized gently as the condition permits. Forced manipulation of the joint, especially in the early phase, is generally not helpful. It used to be thought that dislocated discs should be surgically repositioned during an open joint operation. This produces about a 90% cure but the same result is obtained spontaneously without surgical intervention. In a few cases limitation persist longer than 6 months and then may respond to arthrocentesis – injection of sterile saline or Hartmann’s salt solution into the joint to break down adhesions between the disc and the bony joint components. This procedure can be performed either blind or under arthroscopic guidance and it sometimes referred to as lysis and lavage. In the event that this procedure is no successful, surgical meniscectomy and disc replacement may be indicated but is required in only a very small number of patients. Is there any significance in the history of joint hypermobility? Those with hypermobile joints are at higher risk of temporomandibular joint derangement, as well as damage to other joints. However only a small proportion of patients with temporomandibular joint derangement will have this particular predisposing factor. Joint hypermobility would not be a result of the patient childhood gymnastics but those with mobile joints are likely to perform well in such sports. This entry was posted in Oral Care on May 11, 2012 by oileng.